Oh, I've been waiting for this day for ages! I'm incredibly excited to finally unveil the first lot of jewelry in the my new line! 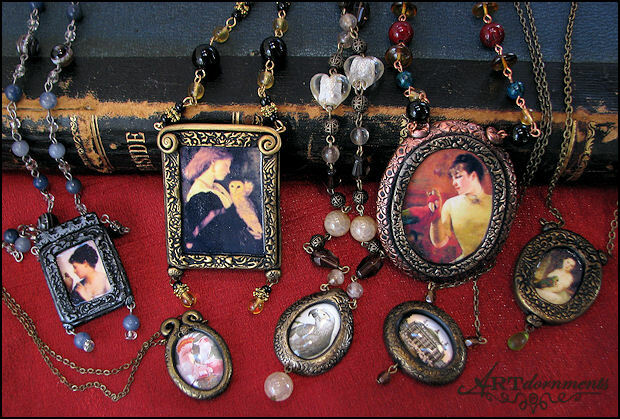 It is called "ARTdornments" and features antique art that I have hand sculpted polymer clay frames around, with various aged metallic finishes. Many of the one-of-a-kind pendants are beaded into unique necklaces with semi-precious stones and beautiful glass beads individually wired together. There are also some simpler styles strung on fine chain. Most of the necklaces pictured include matching earrings. This new line has an old-fashioned feel that invokes the romantic beauty of days gone by. I've always adored past eras, including the styles of Victorian, Edwardian, and Art Nouveau artists, as well as Medieval and Renaissance themes, so a mixture of all of the above is the inspiration for this new line. In the near future I'll be creating pieces featuring some of my favorite Pre-Raphaelite images, as well as many more wonderful avian illustrations and animal themed art. I have to say that I am so in love with this particular style, more than any jewelry I've ever created! The pieces currently for sale in the new style feature: Major Mitchell's/Leadbeaters Cockatoos, Lady with Barn Owl, Girl with Amazon, Lady with Greenwing Macaw, Lady with Bird (Unknown Species), the Garnier Paris Opera House, and an African Grey in Bronze Setting. (Grey lovers, I want to let you know that I will be listing a different Congo African Grey necklace set in an antique silver setting next month.) I plan to have at least one new ARTdornments piece to auction every month along with all of the "regular" parrot jewelry that I offer in my monthly collections. However, like all of my sculpted work, these pieces are one-of-kind, so if you see one that you really love, be sure to bid!